I must have met Mayu, or at least seen her face, sometime in the 2012-2013 academic year. But I didn’t notice her until this school year. May 17th to be exact, about a month after the school year had begun. In fairness to me, Mayu attends a big junior high. There are about 450 kids across three grades, and I’m only at this school on Fridays. I struggle to remember these syllable sequences completely unlike any I heard the first 29 years of my life, and while I know many of the kids at my Monday – Thursday school (which fields a roster of only 100), at this point I do a better job reading the Chinese characters that adorn the patch sewn onto the uniforms at the larger school than I do actually remembering names. Some kids we remember because their English is head and shoulders above average. Others because they are energetic or rude, both of which are atypical Japanese traits. Then there are the cute ones, the short ones, the tall ones, the fat ones, etc. Mayu? I noticed Mayu because she was the sad one. After class I asked the teacher about her and commented that she looked sad. Here I should mention that unlike the American system, Japanese students have all of their classes with their homeroom. It is the teachers who rotate in and out. At the beginning of eighth grade the homerooms are reshuffled, and that is the group a student stays with through the end of ninth grade. 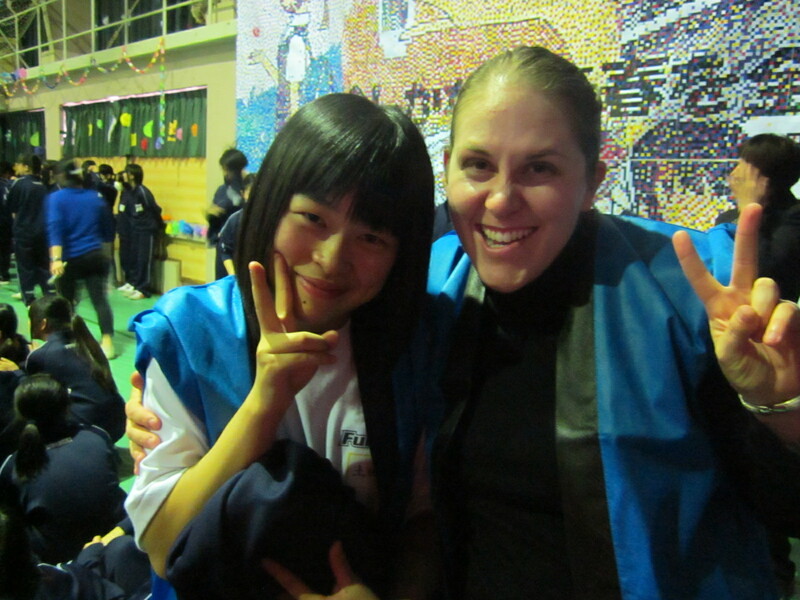 A few weeks later, Mayu came up to me in the hall. I smiled at her and she, in her very limited English, slowly and clearly said, “I am happy!” That was it. No greeting. No asking how I was. Just a statement, delivered unsmilingly, that she was happy. It took me a few minutes to process, but I realized word had gotten to her that I had expressed concern. She was probably sick of people noticing and that was her way of chewing me out. It’s a tricky balance: Knowing when to say something and when not to. Mayu looked sad. That’s all I got. Since then, she has looked better. Not happy, but not depressed either. Bowing to the infinite wisdom of the Board of Education, I didn’t go to her school for a couple months during the summer. I still prayed for her but I didn’t see her. I didn’t know then and I don’t know now if that was the right move or not. Junior highers, in any country, are temperamental things, and it isn’t exactly cool to have a teacher defend you, much less a teacher who is a foreigner. Then came Friday. In preparation for a culture festival today, three girls came to fetch my coworker, Bryan, for a dance rehearsal. I asked if I could come to. They were happy to have me. Mayu was one of the girls. I opted to tread lightly, not knowing what our status was. To my surprise, Mayu took my hand and led me around, making sure the leader knew I wanted to learn the dance and crafting me a pompom that I would need for today. Taking my hand and holding it for several minutes is a more intimate gesture than anyone else has shown me in this country. And crafting me the pompom? The five love languages are present in Japan, but in modified form. Acts of service, on a culture wide level, ranks extremely high. It doesn’t naturally register with me, and so as Mayu made me this pompom I intentionally noticed this and chose to feel loved by it. “This is something. This is a sign,” I reminded myself. Today while hanging out with a few of the girls, I sang the line, “perhaps, perhaps, perhaps” from an old Snapple commercial (side note: I JUST found out that Doris Day is the one who first sang this). Mayu must have massively misunderstood me, because she turned to me and deliberately said, “My name is Mayu.” It can be tricky speaking in English around these kids. A lot gets misconstrued. “Yes,” I said to her in Japanese. “Your name is Mayu. Mayu T*******” She whirled around, surprised that I knew her last name. But she looked excited. “Yes,” she said, pointing to her name tag. I let her believe that I had just read it instead of the truth, that I memorized it months ago. Her last name isn’t common. In fact, I don’t know anyone else with that family name. And that is remarkable in this country where certain family names are so common that Smith and Jones are put to shame. I can name 20 Satos, 20 Watanabes, 15 Yoshidas, and a dozen Sakumas off the top of my head. But of her family name, she is the only one. If I hadn’t memorized it, I certainly wouldn’t have been able to read it. Mayu pointed to her friend’s name tags. I could get the last name or a syllable from each of them. That one was a Sakuma. That one has the kanji for “beautiful” in her first name. It’s pronounced “mi” and so there are a lot of women with “mi” in their first names: Fumi, Nami, Miku, Miu, Amika, etc. But Mayu was the only one in the group about whom I knew the first and last name. That’s something. Soon we were back in the gym, getting ready to perform the dance. Bryan handed his camera to Adam and asked him to take pictures. Adam came over and snapped one of Bryan and I, then turned the lens towards the girls. Mayu turned the other direction so she wouldn’t be in the picture. “Why?” I asked in Japanese. “No, no, no,” she replied in English. “Your face is cute,” I said, staying in Japanese. “No, it’s not,” she said. And we each repeated ourselves a couple of times. After the dance was over, I grabbed my camera and got a picture with Mayu. Again, I don’t know if that is the right move. I’m trying to craft a balance between making her out to be a teacher’s pet and showing her that I think she is special, I think she is beautiful, and that I care about her.